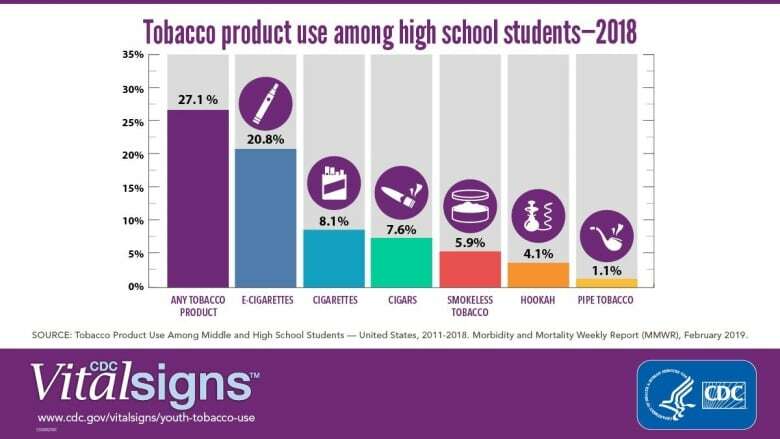 The CDC findings come from a national survey conducted last spring of more than 20,000 middle and high school students in the U.S. It asked if they had used any tobacco products in the previous month. Some of the findings had been released before, including the boom in vaping. Smoking, the leading cause of preventable illness in the U.S., is responsible for more than 480,000 deaths each year. The U.S. Food and Drug Administration bans the sale of e-cigarettes and tobacco products to those under 18. Last week, Health Canada also announced it intends to restrict youth exposure to vaping ads and to limit the display of vaping products in stores. The regulator also released a public service advertisement to teen vaping. Right now, many teens are hearing about vaping not through ads, or even though social media. Instead they’re learning about it from their friends, according to survey research commissioned by Health Canada.